Advanced Ionospheric Probe (AIP) designed by National Central University is recently accepted by National Space Organization to install onboard the FORMOSAT-5 satellite as a piggyback science payload in 2012. The FORMOSAT-5 satellite is scheduled to launch at the beginning of 2016 and anticipated to fly in a 98.28° inclination sun-synchronous circular orbit at 720 km altitude in the 1030/2230 LT sectors. The orbital coverage provides a great opportunity to survey the Earth globally from equatorial to polar region. 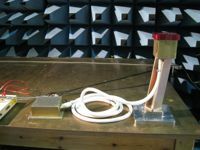 The AIP is an all-in-one plasma sensor under constraints on power (5 W), weight (5 kg), and form factor (100 mm L x 100 mm W x 100 mm H) but with sampling rate up to 8,192 Hz to measure ionospheric plasma concentrations, velocities, and temperatures over a wide range of spatial scales. Once comprehensive dataset available from the AIP, a systematic examination of longitudinal and seasonal variations of the ionospheric parameters in the topside F region can be conducted for all latitudinal coverage. The transient and long-term variations of ionospheric plasma can be monitored in the upcoming solar maximum period and are benefit to public and scientists who are interested in space weather and seismic precursors associated with strong earthquakes. For more information about AIP, please visit the FORMOSAT-5 AIP SDC.